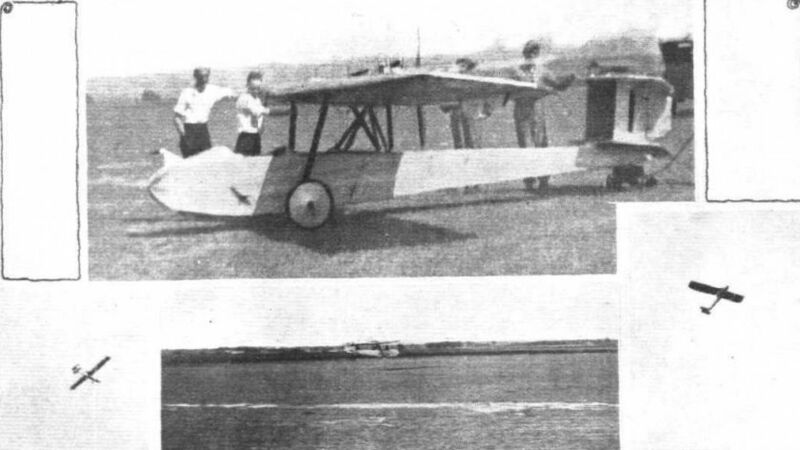 THE only all-Australian light 'plane in the competition was the Wackett monoplane, No.1, which was fitted with a Wackett engine. The designer of this machine is Squadron-Leader L. J. Wackett, who is Senior Technical Officer of the Royal Australian Air Force ДальшеMore>>> and O.C. of the R.A.A.F. Experimental Station at Randwick, New South Wales. Concerning the flying of this machine (which was piloted by its designer), our correspondent waxes enthusiastic and says, "All this pilot's landings were beautiful to watch and, occasionally, sensational. Once he forced-landed at high speed about 80 ft. from a barrier erected to keep the crowd back, ran almost into it and turned right round at the last moment. Another time a piston broke and he landed close to a fence, hopped that, saw a ditch just too far away to get over so bumped down on top of it and bounced clear without any damage." THE Wackett monoplane itself is shown in some of our photographs. It is, it will be seen, a machine of somewhat unorthodox design, being practically a monoplane flying boat on wheels. The monoplane wing is mounted high above the fuselage, parasol fashion, and carries on its rear spar the engine which drives a pusher airscrew. By detaching four struts the wing may be pivotted on the cabane, the folded dimensions being about 7 ft. by 33 ft. The Wackett engine is a two-cylinder horizontally opposed of 1,490 c.c. capacity. It was far from being properly tuned up for the competitions, and so did not allow the machine of doing as well as it otherwise would have done. In spite of this, however, Squadron-Leader Wackett managed to put in a good many hours' flying during the week. The biplane tail is a curious feature of this machine. The fuselage is arranged for two seats, but owing to the sulky engine no passenger flights were made. AUSTRALIAN LIGHT PLANES: No.1, the Wackett pusher parasol monoplane. Note the biplane tail. This was the only all-Australian machine, the engine also having been designed by Sqdn.-Ldr. Wackett.